Guys! Look at the latest addition to our house: a roman shade made by Rachel Epperson, owner of The Needle Shop. When we were in Stockholm earlier this year, we found this fabric in a shop and I was instantly smitten. I think I drooled on it a little. Rachel immediately snatched it up and offered to make me present. My understanding is she went to Home Depot, bought some wooden dowels and a couple doodads, waved her arms around, and this was the result. You can't even see the drool now. It's so fantastic I can hardly stand it. The fabric is by Almedahls, designed by Kerstin Boulogner in the 1950s. It's available by the yard at Hus & Hem or as a tablecloth at Huset. And if you live in Chicago and want to learn how to make your own roman shade, The Needle Shop has a class. How awesome! I would drool a bit too if I had found that fabric. Swoon! I love it! 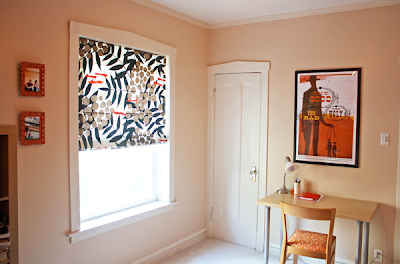 I desperately need to make roman shades for my office. Thanks for sharing! It's simply the coolest fabric ever. Wonderful! I might have to get the tablecloth. Wow! You have a great friend there! AND a great roman shade! You do need to learn to stop the drooling, however. Jen Duncan... I've had your tutorial bookmarked since day one, but haven't gotten around to trying it yet. It's now added to my Pinterest board. Someday.... ! The shade looks very sharp! And the tiny foxes are so cool. Great fabric find! It is fantastic, love the fabric!!!... anytime you mention The Needle Shop I wish there was one closer to me... :( I would love to take classes there! That is fantastic! Do you think she'd let people order them from her? Love your fabric. Great shade, and I like the little peak on your top moulding! Omg, I LOVE the little orange foxes. I was already smitten but when I scrolled down and saw that the orange bits were foxes...!!! Just wanted to say Hi and tel you how much I love your blog. You have so many cool ideas and a great writing style. Roman shades are easy and fun! Love it!! 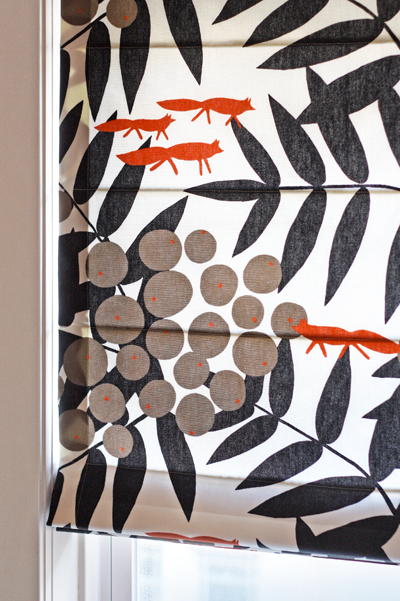 Okay, "roman blind" just got added to the Fall to-do list...that is gorgeous! LOVE the fabric! That fabric is so fabulous! Those orange foxes are adorable! Love! I love it! I've been drooling over that fabric for over a year now. In fact I posted about a table cloth made from it (from New House Textiles) when I first started my blog. Awesome! Wow, that is AWESOME!! Love it! Oh, how lovely! I'm impressed with the results --- kudos to your friend! The color and print look great in that space. I love it! Perhaps you know but the pattern is based on the story of the fox looking up on the rowanberries realizing he can't reach them, comforting himself saying "they are sour ". Meaning; they are hard to reach and its probably not worht it anyway! So now you know why the fabric is called "Sour said the fox"! Ah ha! I knew the name of the fabric, but not the story. Thank you, Gunhild! I love the roman shade, the fabric, the paint color of the room, the gorgeous light of the room, the inviting desk, the cowboy´s poster... everything!! I absolutely could have a studio like that one :) Thanks for sharing and congrats for having a place that beautiful! ohmygod that FABRIC! the foxes are delightful!